Artist, Robert Blehert, paints portraits of women – not in the traditional style of painting women showing their physical likeness – but painting them in FLOWERS. He captures the “essence” – and paints their “essence” on canvas as he views it. They are flower portraits done of women. Robert talks with them in person or by phone, or hears about a particular woman or girl, and then using a highly textured acrylic style of painting, rapidly captures that person's "essence", spirit or personality on canvas. "It is quite magical what happens when I do this", says Robert. "Women I have only talked with for 30 seconds and painted in this manner are telling me things like, 'those are the exact colors I love and use in my home', or, 'If I saw 100 paintings this is the one I would buy'”. Many women who have had their "essences" painted in this way, have stated that it made them feel more beautiful, more special, and more confident about who they are. In this day and age it's refreshing to hear results like this without the necessity of sprays, lotions, etc. In Robert's own words: "It's the most spiritual pursuit of all my art endeavors". Born in St. Paul, Minnesota, Robert Blehert did his first commissioned work at the young age of 15. He learned to paint in the style of the old masters at the Pacific N.W. “School of Living Oils”. During his long career – Robert has accumulated an impressive list of clients – including portraits for Hollywood movie producers and celebrities, bank presidents, and paintings of sports heroes for Major League Baseball and the National Football League. Whether it’s oils or acrylics, portraits or landscapes, realism or impressionism – his paintings can be found in private and corporate collections throughout the United States and abroad. Recently, he was commissioned to paint the late Pope John Paul 11 by the Archbishop of the Seattle Archdiocese. Robert currently lives in Seattle with an art studio on Lake Union (famous from the movie “Sleepless in Seattle”). Robert has this to say about his recent excitement with painting the essence of women in flowers: "It's really getting back to basics. It's incredibly fun for both the subject and the artist, and probably makes the most personal and beautiful gift someone can get for themselves or for a friend." 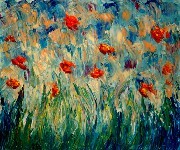 For more information on the artist, you may visit: www.RobertBlehert.com . © 2007 FlowersOfYou. All rights reserved.